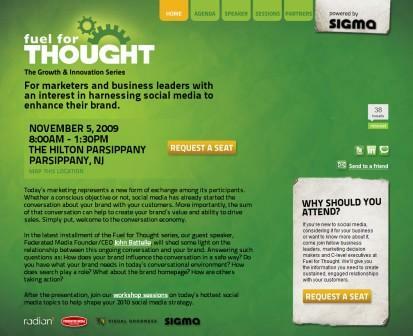 Kinnelon, NJ – Simple Marketing Now LLC has issued an update to the newly established Social Flooring Index. It is available on Social Flooring Index and examines the flooring industry’s involvement with social media marketing tools such as Twitter, Facebook and blogs. The Index, which has been issued in three separate parts, was issued in Beta version in July 2009. This latest update includes additional data points that better capture how the industry overall has started to experiment with the tools of social media marketing. The Social Flooring Index highlights social media marketing success stories. These are of benefit not just to the flooring industry, but also to any industry or company getting started with social media. “The Index includes companies that are just starting out with social media, those that have dabbled and aren’t sure how to proceed, and those which fully embrace the interaction that these tools enable with customers,” says Whittemore. Home Depot [@HomeDepot] and UK-based McKay Flooring [@holeinhiseye] are two active Twitter flooring examples. Lowe’s Home Improvement and Palmetto Floors represent examples of active Facebook Fan pages. The Carpet and Rug Institute Blog, Canadian Build Direct’s blog and Carlisle’s Wide Plank Flooring Blog are successful blog examples. In all three categories, best practice calls for engagement with readers, fans and followers, and frequent, consistent updates that offer relevance and value in a conversational tone. The Social Flooring Index provides a direct measurement of flooring industry companies and how they use and integrate social media tools into their day to day business. It also clearly highlights who is, and who is not, making use of the new tools. “I see opportunity for the flooring industry to make use of the tools of social media to strengthen relationships with their customers. Not just with consumers, but also with Business to Business customers,” adds Whittemore. The Social Flooring Index will be updated quarterly and will continue to evolve. Included are fiber manufacturers, retailers, manufacturers, associations and publications – all affiliated with the floor covering industry. For more information about the Social Flooring Index, visit http://www.SocialFlooringIndex.com. 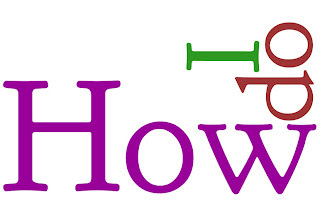 For information about Simple Marketing Now, visit http://SimpleMarketingNow.com. Or, simply contact Whittemore at cbwhittemore [at] SimpleMarketingNow.com . Simple Marketing Now is a marketing communications consultancy that provides organizations with the right combination of traditional marketing and social media marketing to improve the customer experience and build brand. 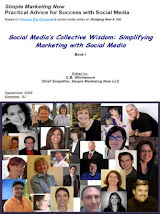 For more information, visit http://SimpleMarketingNow.com. This question comes up all the time. And, no wonder. There's plenty of hype and buzz out there about social media, social media tools and social media marketing. Everyone's bringing it up. Even newscasters refer you to Twitter to keep up with late breaking developments. It's confusing to say the least. I like to start by putting social media marketing into perspective. You see, we sometime forget this, but markets are conversations - a statement from the 1999 book called The Cluetrain Manifesto. Through conversation, buyers and sellers exchange information; they have the opportunity to develop trust and build credibility. Conversations set the stage for loyal communities based on shared experiences and stories. Conversations take place between people, not between brands or companies. Not too different from how business used to be conducted before the days of mass markets, as Jonathan Salem Baskin reminded us in 10 Ideas to Refocus Branding. The tools of social media - e.g, Blogs, Twitter, Wikipedia, Flickr, Amazon reviews, LinkedIn, Facebook, YouTube... - facilitate these intrinsically social conversations. These tools are easy to use, mostly free, and they bring back conversation, interaction over common interests, and the sharing of value through relevant content. The tools aren't going away. They may morph, but the principles remain and affect us all. They enable us to strengthen connection, build trust and develop authenticity. They are certainly critical to establishing a digital presence. Getting started is about taking small, thoughtful steps, say 15 to 20 minutes per day. Thoughtful in that you want to step back and consider how on target your efforts were after each short session. That allows you to recalibrate and avoid getting sucked into the fire hose of information. You need to start, though, and be consistent about your explorations. Although Twitter tends to capture most people's fancy [I get more questions about Twitter during presentations, than about any other social media tool. ], I strongly suggest that you start by exploring blogs. Through blogs, you will uncover thought leadership as well as leads to other resources. Blogs represent home base for other activities taking place on Twitter or Facebook, for example. Blogs will help with making sense out of Twitter. How to go about finding blogs worth exploring? Start with a topic that interests you or relevant industry terms. Maybe it's "marketing to women" or "simple marketing". You may refine your terms as you discover more. Be sure to pay attention to the resources listed in blog sidebars. They will be sources to other links and blogs worth exploring. Once you find blogs of note [you might want to review How Do I Evaluate A Blog? ], subscribe to them. Most blogs will offer you two options: RSS [i.e., Really Simple Syndication that you read through a feed reader] or email updates. As you start to explore, you will discover communities around related blog topics, and ideas worth sharing with customers, peers and friends. And possibly even worth commenting on! Are you ready to get started with social media? What do you find works best for you? And what other questions do you have? 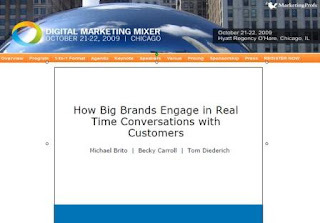 Given my interest in practical marketing, I was particularly interested in Becky Carroll's, Michael Brito's and Tom Diederich's presentation titled How Big Brands Engage in Real Time Conversations With Consumers during the 2009 MarketingProfs Digital Marketing Mixer. + Tom Diederich contrasted Symantec and Cadence where he built communities using two different approaches. Michael started the session off by putting into context why a company would want to engage in conversation with consumers: because consumers now expect a social media presence. Add to that what Altimeter's Charlene Li discovered in her recent study: deep brand engagement correlates with financial performance. Engaging and connecting with customers is critical stuff. Intel discovered as much when it discovered [by listening on the social web] a need for Ajay Bhatt t-shirts -- as a result of Ajay Bhatt, who invented the USB, being an Intel Star on a TV ad. Intel responded by filling that need and created a memorable brand experience that has led to an Ajay Bhatt Facebook Fan page, 1,500+ fans on Twitter, user generated content and new level of loyalty and customer retention -- all by engaging with customers via social media. Read through the Facebook Fan page content. It's really interesting. Becky Carroll, using the example of Hansen Sodas, addressed the evolution from social media campaign to ongoing relationship. Her first involvement with Hansen, a West Coast soda brand with a loyal following, involved a campaign to draw San Diego fans in with a photo contest. The problem was that, when the campaign ended, the conversation stopped. You cannot let the interaction go silent if you choose to engage customers with social media. Social media builds trust and community; it increases engagement and loyalty and, if you go silent, you break the trust. Based on those learnings, Hansen took a different approach to connecting with San Francisco. In addition to the photo contest, it engaged fans via Twitter [@hansensnatural] and Facebook as well as offline events. Tweets drew fans to the campaign Facebook page and then to the company fan page. According to Becky, Hansen quickly saw an improvement in traffic and relationship building as a result of social media. Facebook was particularly effective to generating referrals and votes for the photo contests. Overall for San Francicso, Hansen saw an ROI of approximately 12 cents/reach. Tom Diederich contrasted two experiences for us. That of starting from scratch with building the Symantec Technology Network community and having community be front and center for Cadence with it featured on the Cadence.com home page. He asked customers what they wanted to read. He thought of the blog and forum as similar to a newspaper with distinct sections. He recruited internal experts, created weekly editorial meetings to keep blog posts on track, and invited super-users to become part of a special VIP program. + Be a business owner who oversees budgets and sets direction. + Have a set of comprehensive guidelines. + Have well-defined procedures for when violations or other issues arise. Contests are not effective for sustaining relationships. Along with having social media guidelines, also conduct digital training. Be sure to include and integrate social media into your other marketing. Definitely do research to understand how people search for you. What are you reactions? And, what would you add? 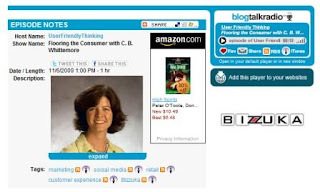 I had a blast last Friday, November 6, 2009 on User Friendly Thinking BlogTalkRadio with Bizzuka CEO John Munsell and my friend Paul Chaney. The topic was 'flooring' the consumer! On the Friday, November 6, episode of User Friendly Thinking radio, our guest is C. B. Whittemore, marketing consultant with Simple Marketing Now LLC. We're going to be discussing flooring the consumer. Of course, there is more to the term "flooring" than meets the eye. C.B. was formerly Director, In-Store Innovation for Solutia's Wear-Dated carpet fiber. We will be talking about ways to improve the customer retail experience and about businesses, both digital and brick/mortar, who are passionate about meeting the needs of their consumers and who successfully bridge traditional marketing with social marketing. C. B. is also the editor of Flooring the Consumer, a blog about improving customer experience. 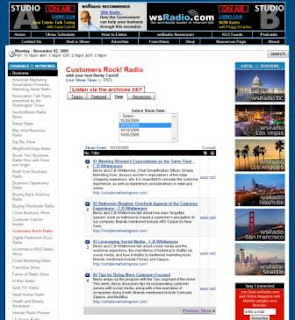 Join us Friday, November 6, at noon central for another edition of User Friendly Thinking radio. After we got through the basics [i.e., my background and Simple Marketing Now] and discussed whether shag carpet was coming back, John asked me to discuss in more detail 'flooring' the consumer and how that notion led to starting Flooring The Consumer, my blog about the retail experience and marketing to women. From there, we explored my philosophy of 'simple marketing,' bridging new and traditional forms of marketing, how social media aids in improving the customer experience and how offline customer service relates to the online equivalent. We touched on websites and how to ensure that they look 'alive' - BTW, do check out Bizzuka's recently launched social site for their client Dr. Dale Archer, which we talked about - and the Bathroom Blogfest [lucky Paul and John visited both Flooring The Consumer and Simple Marketing Blog right smack in the middle of all of the Bathroom Blogfest excitement! Can you imagine?]. Finally, we exchanged perspectives on where advertising and marketing are headed. 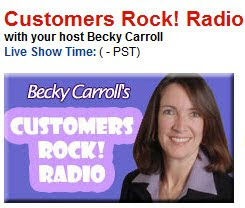 Here's a link to the full one hour interview: Flooring The Consumer with C.B. Whittemore. I also recommend that you check out past episodes of User Friendly Thinking, all of which include amazing insights from the most User Friendly Thinkers around. Thank you, John and Paul, for a wonderful and lively opportunity to discuss a subject that I feel so passionately about! And, John, I look forward to meeting you in person soon so we can continue the conversation. In honor of the Carpet and Rug Institute Blog reaching the six-month mark, I thought I would share with you a case study documenting what it has achieved in those 6 months. The Carpet and Rug Institute (CRI) is a nonprofit trade association representing the manufacturers of more than 95 percent of all carpet made in the United States, their suppliers and their service providers with the goal to "help increase consumers’ satisfaction with carpet and to show them how carpet creates a better environment." What is particularly remarkable about the CRI is that it generates a wealth of high quality actionable research about carpet that is available to consumers, writers, specifiers, builders, contractors and retailers. Unfortunately, the information isn't always easily 'findable' within the CRI website and, as a result, doesn't readily connect with relevant searches. 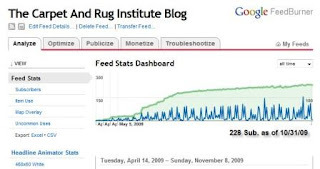 How to cost effectively increase the visibility of the Carpet and Rug Institute's research based resources and counter the myths surrounding carpet? A self-publishing blog platform would enable the CRI to address its key carpet-related topics in an accessible and conversational manner while highlighting relevant research and marketplace activities. On March 26, 2009, I received approval to start on the CRI Blog. The CRI Blog published its first post on April 7, 2009. It was 'soft' launched on April 13th, introduced to the CRI Market Issues Committee on April 20th and publicly announced on April 27th. Since launch, we have published two stories per week. Since launch and as of October 31, 2009, 59 stories have been published all relating to the programs with which the Carpet and Rug Institute is involved. As stated on the CRI Blog, "the Carpet and Rug Institute's job is to go well beneath the surface and prove how our environment for living, working, learning and healing is better - thanks to carpet and rugs. Through science-based research, customer advocacy, environmental stewardship, we serve our members and their customers. 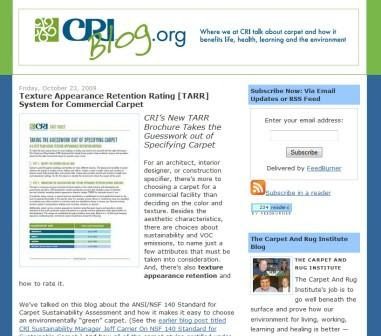 CRI initiatives help protect carpet's life and beauty and demonstrate its air quality benefit." + Carpet Cleaning Tips For Dummies: Get Yours Now! In that timeframe, the CRI Blog has generated strong momentum in attracting subscribers: 228 as of 10/31/09 [vs. 25 at the end of April]. Whereas early subscribers came primarily from the immediate industry, new email subscribers come from a wider audience base [e.g., government, floor inspectors,...]. The rate of growth has reached a more sustainable level of 5-7% per month. Visits to the CRI Blog continue to increase. This is both a function of publishing more content each month and producing high quality content relevant to search queries. 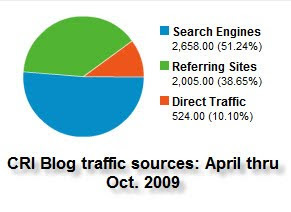 The total for the period from April 7 through October 31, 2009 is 5,187 visits. Page views total 7,709 [per Google Analytics]. Per Sitemeter data, the average number of visits per day has increased from 40 in August, to 43 in September and 46 in October. Similarly, page views have increased from 1.4 to 1.6 over the same three months and time spent per visit engaging with CRI content has increased from 1.3 minutes to 2.13 minutes. This is significant because it means that a new audience, beyond industry insiders and those already familiar with the Carpet and Rug Institute, is becoming aware of the CRI and its information about carpet. The CRI Blog is successfully increasing the visibility of valuable CRI research based resources. - The costs associated with the CRI Blog consist primarily of Simple Marketing Now fees for strategy, editorial support and data analysis. The blogging platform - Blogger - is free. We purchased several domain names. Bethany Richmond and James Beach, the primary content creators, have assumed responsibility for the blog as part of their CRI job accountabilities. -->Total blog related costs for 6 months are under $20,000. Total ROI for 6 months: significantly positive! * Note: unfortunately Technorati no longer tracks blog reactions. I have substituted Google Analytics data instead. This ROI calculation does not include quantification for the Noteworthy Successes described below. From a practical perspective, the CRI Blog has successfully countered misrepresentation from Health Magazine, a traditional shelter publication. As Bethany Richmond, CRI Communications manager, reported in CRI Communciations Manager Bethany Richmond Interviewed on TalkFloor.com. More specifically "in these two blog posts about how carpet was treated unfairly in an article that appeared in Health magazine, the blog posts developed a higher ranking on Google than the original article: Contrary to Health Magazine Headline, Carpet Won't Make You Sick and Carpet Fact-checker Files." The Carpet and Rug Institute Blog has kept digitally visible a critical article by Werner Braun, chairman of CRI, titled "Scientific Facts Dispel Carpet & Asthma Myths" published in the April 2009 issue of National Floor Trends magazine [see NFT: Scientific Facts Dispel Carpet & Asthma Myths]. Without the blogpost, the original article would have faded from view. The CRI Blog gives permanent digital life to all of the articles, ideas and research reports that the CRI submits to outside resources and that would otherwise become inaccessible. As a result, the blog remains a 24/7 digital deterrent to misinformation and disinformation about carpet and the benefits it offers. The CRI Blog has made possible an evergreen digital brochure listing CRI Seal of Approval success stories. Not only have the success stories generated goodwill and increased awareness for an aspect of the carpet owning process that truly benefits from fully understanding and appreciation how best to care for and maintain carpet, but it has also led to signigificant cost savings. Imagine the cost of creating a traditional brochure listing those case studies. Not to mention that the minute a new case study opportunity arises, the brochure becomes out-of-date and that most of us prefer to refer to relevant information digitally. Paper copies have become wasteful from more than one perspective. It has also led to the creation of a CRI YouTube Channel to better communicate via video the benefits associated with carpet cleaning best practices. Those videos are being used in the CRI Blog [e.g., see Jet Stream Grill CRI SOA Success Story On Video]. Last point: in a Google search for 'carpet blog,' the CRI Blog comes up on page one of search results. In six months' time, the Carpet and Rug Institute Blog has demonstrated its worth as a cost effective self-publishing platform for raising the visibility of the CRI's research based resources. It is a natural marketing and communications tool for broadening the reach of the CRI's messages. Given the consistent and positive growth trends, the strong positive ROI and the effectiveness of the CRI Blog in counteracting carpet's urban myths, imagine what the next 6 months have in store assuming continued commitment to consistently publishing high-quality and relevant content. Congratulations James, Bethany, and the entire Carpet and Rug Institute on reaching the six month mark! I can't wait to report on the CRI Blog's one year anniversary! Questions originally uploaded by oberazzi. 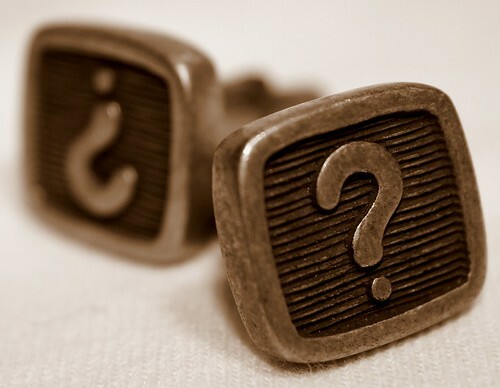 How often do you stop to ask yourself questions about your customers and website visitors? About how they might react to some of the fancy effects you've decided to implement? Or, do you just assume that they'll love it? Here's a list of 22 Things You Don't Know About Your Customers from Conversation Marketing's Ian Lurie. They reminded me of the "curse of knowledge" described in Made to Stick: Why Some Ideas Survive and Others Die ... and had me thinking about assumptions and re-evaluating my own website experiences. #5: Dark text on a light background. I prefer it to such an extent that the opposite stresses me. I run away. Dark text on light background is a classic for a reason: it works. #9: Website addresses are hard to remember. I love that Chrome is more forgiving of typing partial web addresses. The point here is to include ways to subscribe and bookmark your site to simplify remembering addresses. Don't forget to reserve variations on your name. #16: They aren't enticed by mystery. Better to be clear, straightforward, and transparent. No tricks. No deliberate misdirection. #17: They get lost a lot. So, be helpful with robust onsite search, clear navigation and a user-friendly 404 error page. I like the suggestion to review your online analytics to determine where customers have problems. #22 They need to want. And you need to know how they express those wants. Take advice from Lori Magno as she describes how she listens and researches to know how customers find her jewelry. Do read the entire list as I'd love to get your perspective. What questions do you regularly ask yourself? What have you observed with your customers and their online behavior?